Learn how to make the most of the present moment and give the gift of presence to those you love. In Part 4 of the Mortal Wisdom Series I’ll discuss how to develop the skill of Presence to use in your personal life and work. Presence is the secret of living fully in every moment and you’ll learn how to enhance your ability to stay focused and present in day-to-day life. These are the lessons we can learn from our mortality and how to thrive in life while knowing that death awaits. Listen to Parts 1, 2, and 3 first if you haven’t heard them yet! When someone is about to die, if you sit with him stably and solidly, that alone may be enough to help him leave this life with ease. If you enjoy this content please share it with others and consider leaving a review on iTunes! Thanks again to all supporters on Patreon.com/eolu! My birthday mandala on the beach! Grateful for my hubby Larry who helped make all my dreams come true today on my #birthday ! A perfect dessert to end a perfect day! Caramel pecan monkey bread for birthday breakfast! Heavenly! Sign up for A Year of Reading Dangerously and join us online in reading one book a month about death and dying for 2018! Learn more here. Thank you to our legacy sponsor Suzanne O’Brien RN of Doulagivers™! Thank you to our newest sponsor: Authentic Presence Training from the Spiritual Care Program! Thank You to Our DIAMOND LEVEL SUPPORTERS!! Get Dr. Wyatt’s Award-winning book: What Really Matters! 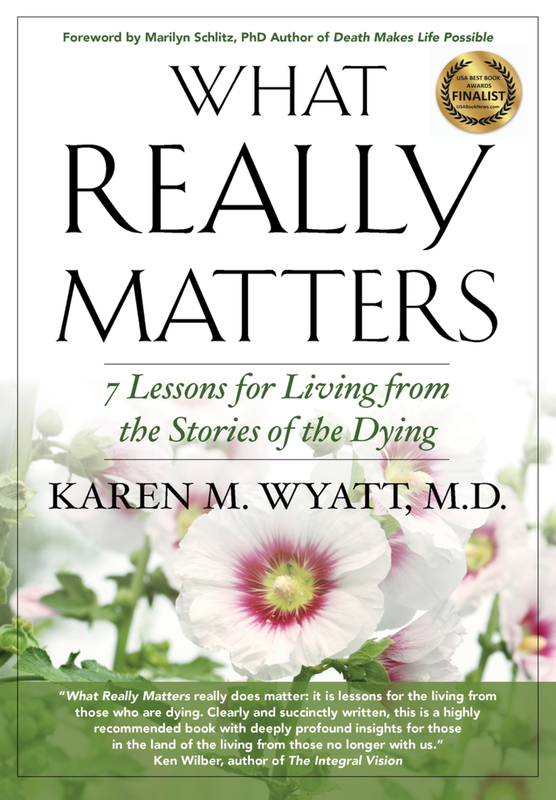 In this book of stories gleaned from her work as a hospice physician, Dr. Karen Wyatt shares the life lessons and spiritual transformations experienced by her patients and their loved ones at the end-of-life. Through poignant tales of love, forgiveness and surrender she chronicles her own spiritual growth as she learns to cope with grief and transforms the way she lives her life. These lessons from the dying contain timeless wisdom for anyone searching for deeper meaning and purpose in life and form a map for non-religious spiritual growth in contemporary society. Readers will learn a step-by-step path to enlightened living, the secret to transforming adversity to opportunity, the keys to living fully in each and every moment, and a strategy for overcoming fear and finding unlimited joy within. Get the book on Amazon or Kobo. Note: Some of the links on this site are affiliate links. The price stays the same for you but if purchased through this link End-of-Life University receives a small commission, which helps cover the costs of producing the interview series, blog and podcast.